Today, we’re very excited to welcome back author Sheri Fink on the Reading with Your kids Podcast! We’re thrilled to introduce Sheri’s brand new book The Little Unicorn, a wonderful story for the kids in your life and for anyone who is struggling to let their inner sparkle shine out! In our exclusive interview with Sheri, we discuss what inspired her to write The Little Unicorn, Why did Sheri choose this theme for her book, Her expectations from the readers, upcoming projects and much more. Stay Tuned for our exciting conversation! Listen in to find out your inner sparkle with The Little Unicorn! Sheri Fink is a #1 best-selling author, inspirational speaker, and award-winning entrepreneur who lives in Southern California. 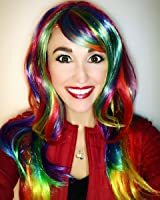 Her brand new children’s book, The Little Unicorn, about a unicorn who loses her sparkle and discovers it within, empowers young readers to develop self-confidence. Her newest children’s book for ages 0-5 is Counting Sea Life with the Little Seahorse. Co-written with award-winning author and husband Derek Taylor Kent, Counting Sea Life with the Little Seahorse takes young children on a magical underwater adventure while teaching them to count. Sheri is also the author of the contemporary romance/women’s fiction novel, Cake in Bed; Whimsical World children’s books: The Little Rose, The Little Gnome, The Little Firefly, The Little Seahorse, Exploring the Garden with the Little Rose, Counting Sea Life with the Little Seahorse; and the inspirational self-help journal, My Bliss Book. Discover books, beauty products, and more from Sheri Fink to inspire and empower you and the special people in your life! www.SheriFink.com. The Little Unicorn lives in an enchanted forest powered by the magic of her inner sparkle. When she begins to doubt herself, the magic within her and her surroundings begin to disappear. She sets off on a journey to save the forest by rediscovering her sparkle, only to find it in the place she least expects. This heartwarming story helps kids realize that we all have an inner sparkle, and we all can create magic when we believe in ourselves. 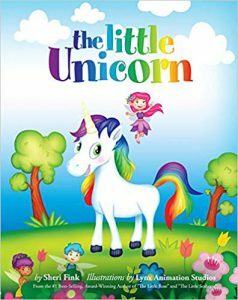 The Little Unicorn book by Sheri Fink is now available on Amazon! Where did Sheri get the idea to write this story? What happens when Sheri Fink visits the schools and how are her visits different than other author visits? Where people can find Whimsical World books online? Exclusive sneak peek into some of the books Derek and Sheri Fink are currently working on? Thanks for agreeing to this interview, Sheri. We wish you all the best with The Little Unicorn!